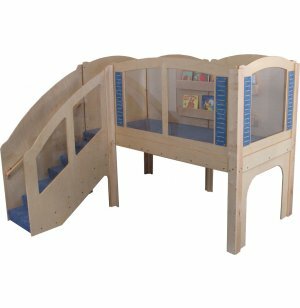 Add space, structure and depth to your learning environment with this Older Toddler Explorer Loft from Strictly for Kids. 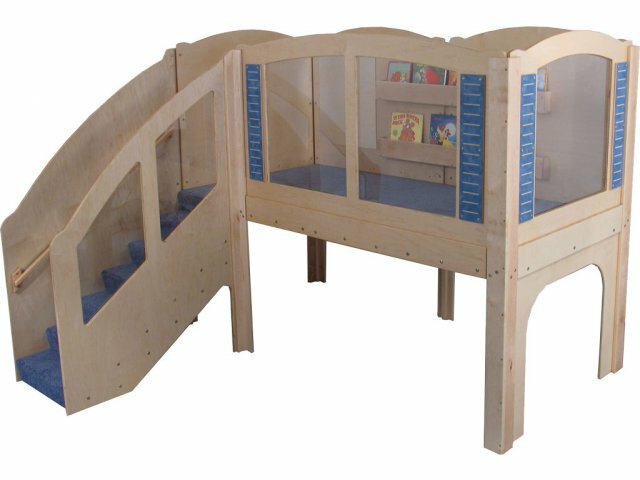 Small children will love to go up and down the steps that lead to a cozy, inviting loft complete with a book display, acrylic mirror, and Lexan windows with shutters. The open space below creates a play area that can be used for any kind of imaginative play. Fully-carpeted stairs feature a side panel with Lexan windows, an open crawl space below and a lower hand rail. Ideal for ages 24-47 months. Safe: Fully sanded and rounded edges and lower handrail on stairs keep little ones safe. Indestructible: Unbreakable Lexan windows keep children within constant view and provide shatterproof security. Creative: Cozy loft with open play space below encourages all kinds of creative and imaginative play. Facilitates Social Interaction: Encourages children to interact and practice social skills.